Every now and then, I realize that some people must confuse food writing with food styling. Why else would anyone, anywhere, ever think that I'd be good at making Vietnamese salad rolls? I'm a writer, not a wrapper. Goi cuon (or nime chow, the Cambodian name that's more popular here in Rhode Island) are fresh (not deep-fried) spring rolls, typically filled with rice vermicelli, bean sprouts, lettuce, mint, cucumber, shredded carrot, and sometimes shrimp or pork, enveloped in a rice paper wrapper and dipped in nuoc cham or peanut sauce. Can you imagine a more elegant way to eat a salad? Called banh trang in Vietnamese, the translucent wrappers contain ground white rice and water, and sometimes a bit of added tapioca flour; they are pressed flat, steamed, and dried in the sun on bamboo mats, which gives them a distinctive basket-weave pattern, before being cut into circles and packaged. Available in 8-inch, 5-inch and quarter-round sizes, the wrappers are brittle, and quite thin. They do get stale, so try and buy from a market or online vendor that has a lot of turnover. Popular in Vietnamese and Thai cuisine, banh trang are practically tasteless and thus a good vessel for almost any type of filling. Grilled shredded barbeque chicken and arugula, tempura vegetables, steamed salmon with fresh herbs ....well, why not a hot dog with all the fixings? Like me, you may create a few torpedoes before finding your salad roll groove, but remember this: if every roll comes out exactly the same size and shape, who will know that you made them by hand? 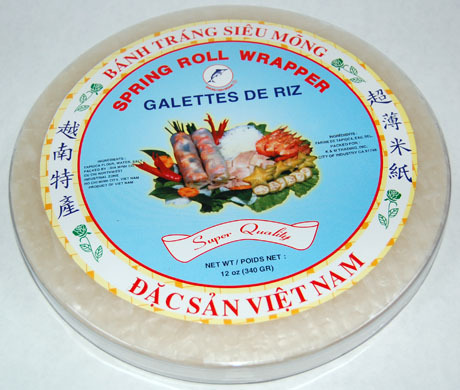 From the pantry, you'll need: rice vermicelli, rice paper wrappers, frozen shrimp. Make as few or as many as you wish. With the components cooked, shredded and chopped, and stored in the refrigerator, assembling these restaurant favorites takes only a minute. Serves 6 or more, depending on what else you serve. Fill a bowl with hot water. Soak the rice vermicelli for 15 minutes, until flexible. Drain. Bring a large pot of water to a boil. Drop in the rice vermicelli, and cook for 45 seconds. Drain, rinse under cold water, and drain again. Set aside. Make sure all of your components are prepared and laid out on your work surface. Cut the cooked shrimp lengthwise through the center to make 2 flat halves. Leave mint leaves whole. Spread a clean dish towel on the countertop in front of you. Fill a large shallow pan with hot tap water. Take one rice paper round and submerge it in the hot water for 20 seconds or until it is pliable. Transfer to the dish towel. Working quickly, take a small bit of rice vermicelli and place it in the bottom third of the round. Top that with a small amount of lettuce, carrots, cuke, bean sprouts, 2 halves of shrimp and a couple of mint leaves. Fold the bottom up over the filling. Fold the sides in, and roll to the top. Place seam side down on a plate, cover with a damp cloth, and continue until you have made as many salad rolls as you wish. They can be stored in the fridge covered with a damp cloth for up to an hour before serving. Serve with two sauces: nuoc cham and Chinese peanut dressing. I do have rice paper wrappers in my pantry: Lydia kindly brought me some from Boston. Unfortunately I was not making nime chow today. I decided to grill pizza. And suffered severe pantry panic. I thought I had a jar of olives my daughter had marinated. Oh they are quite delicious. I searched and searched and couldn't find them. Finally, I discovered them, lurking behind the marinated artichokes in the deep recesses of the cupboard. Whew! Pantry panic turns to pantry pleasure as I add artichokes to the pizza toppings. Now, that's what I call a perfect pantry experience! Does anyone know how to make the rice paper crispy (like corn chips)? I remember them being heated over a fire, I think. Dan, I'm guessing you'd have to soften them first by soaking in water, then you could tear them in strips and toast them in the oven on a baking sheet... but I've never tried it. Lydia, thanks for the response but, that doesn't work. The closest I've come is to deep fry them while still hard. The results is close but they didn't puff up as much as I remember. I think I'll have to go back to Qui Nhon and find a little backstreet vendor and watch or ask. Dan, now you will have to find out and let me know how to do it! Any Pantry readers have the answer to Dan's question? Please advise. Lydia, It appears that no one else has an interest in the subject of "Crispy Rice Paper". The only input I have gotten is to heat enough "Canola" or other oil in a large skillet or wok and "deep fry" whole round until crispy. You then drain on paper towels. You can consume as they are or sprinkle with either sugar or salt and break apart and serve like you would taco chips or potato chips. I have tried this and it works pretty well. Dan, you've certainly got my curiosity up about this -- I will have to try them! Rice paper chips -- who would have thought it? I'll let you know how it works for me. Thank you so much. I love the vietnamese deep fried egg rolls and would like to try to make some. What kind of wrapper do I use? I've tried using the banh trang wrappers (round clear) but took forever to brown and dry? Please help!? Leah, I usually make all of my eggrolls with wonton skins, except the fresh spring rolls with these rice paper rounds. Anyone else have advice for Leah? Take the rice paper and run cold water over it to moisten it slightly. Place the rice paper in the microwave and microwave on high for 30 to 40 seconds. The rice paper will come out crisp and crunchy. Bill, thanks so much for helping Dan with his question about rice paper chips. I've never tried this. Srilaxmi, any Asian grocery store should carry them. Do I have to make all the rice paper wraps at once? Or can I make two or three at a time, and leave the rest in the package for another day? Samie, as long as the wrappers don't get wet, you can keep them in the package for another day. Once they're wet, you need to use them or throw them away. Tauni, these wrappers are not really the best for frying. They're best eaten uncooked, or steamed. For frying, you need to use the wonton wrappers. I found a type of layered rice papers in an Asian store. They appeared to be 2 papers laminated together with black sesame seeds laminated between the 2 papers. Can't recall how I got the idea, but I tried microwaving them, one at a time for maybe 10-20 seconds (maybe a little longer, until they puff up) and they puffed up almost like a fried pork rind. DO NOT WET THEM. Has anyone ever seen those? They made an excellent snack. They were the same size and shape as the regular plain ones, came in the same kind of packet with about the same number of sheets. Though because of the double layer, they are a bit thicker than the others. I need to find Rice Wrappers in Encinitas, CA. Any suggestions?